By Xah Lee. Date: 2010-09-14 . Last updated: 2011-02-13 . I feel the same. Though, i am not sure that other search engines are better. In this or last year, i've occasionally tried Microsoft's revamped search engine “bing.com”. I don't think it's better. Though, it is true that i am not able to find info i want on Google as compared to say early 2000s. There were quite a few times in recent years that i spend 30 min or hours and unable to find info that i think should be there. Often, Google will show results from a bunch of large-scale commercial sites that swipe info from other online forums and put on their site, with bad formatting, and with many disruptive, annoying ads. Since about 2006, when i need some info, my first stop is to find it in Wikipedia, then possibly follow links from there. I've also noticed quite a few up-coming search engines in this year. Here's a list of alternative search engines i've used. For some juicy info about search engines, see: Web search engine. Also, checkout this Wikipedia List of search engines. J C Penney was ranked as number 1 result in Google search for lots of keywords for the past several months. There are 2k+ paid links from random low-ranking sites to J C Penney. http://www.opensiteexplorer.org/ is a online tool specifically designed to find backlinks of any website. Google took action against J C Penney, AFTER this article is published. J C Penney was using searchdex.com for SEO. They are now fired. J C Penney denies knowingly using paid links. European Union is investigating possible antitrust abuses by Google. Here's a example of a site with irrelevant, random, embeded links. 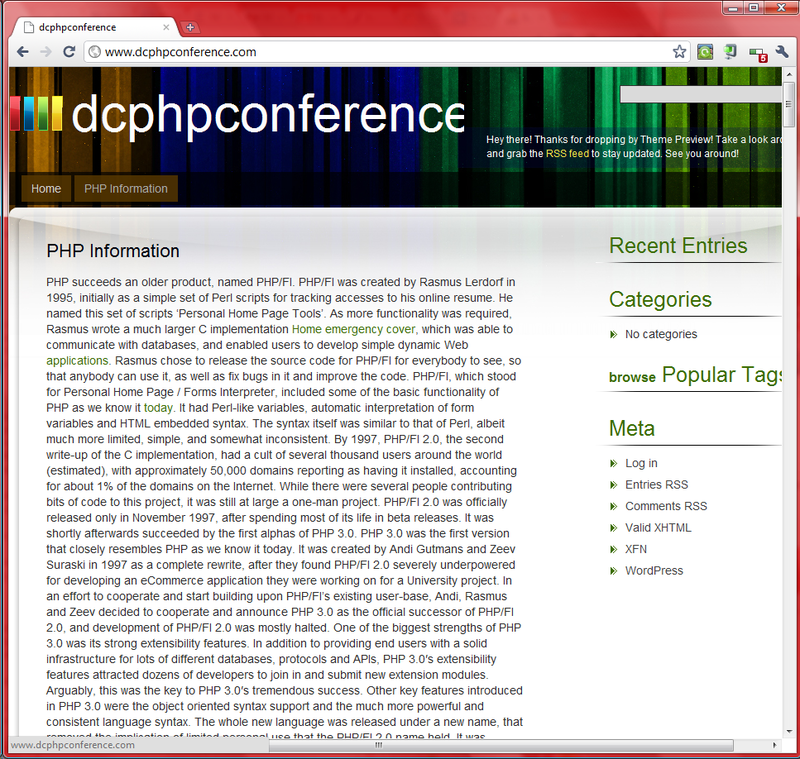 Screenshot of a spam site dcphpconference.com as of 2011-01-21 . The site is 〔http://www.dcphpconference.com/〕. The site is a copy of a article from Wikipedia about PHP programing language, but added tens of irrelevant embeded links in random places that don't make sense. Essentially, any human reading that page will immediately see it's nonsense. To give some context, good articles on my website xahlee.org is Google ranked at 5 at most, and my site has about 7k visitors per day, and is ranked by Alexa at about 70k world wide. Wondering why Google Search is getting worse and why there's so much lousy written crap on the web? Thanks to, Demand Media. They are so-called “content farm”. Hire cheap writers, pay them some like $15 for few hundred words, then spam the web. Churning out 5k articles per day. What are some of their sites? eHow.com , Answerbag.com , Livestrong.com , AllSands.com , WebGuru.com , happynews.com , writeforcash.com , ExpertVillage.com , essortment.com etc. Nathan Staudt wrote to inform me there's http://www.peer-search.net/ that he created. It's actually interesting, and first time i heard of the concept of peer-to-peer search engines. It's based on Yacy, which is a free distributed search engine. De-centralized systems are in general more robust and evolves fast. This could be the future of search engines. I tried peer-search.net on my name “Xah Lee”, and it's quite interesting. It shows many pages that contains my name, reminiscent of Google search results in the early 2000s. In the past, Google search is quite useful in searching pages that contain some exact string. For example, if i want to know all pages that i left a comment, or sites that collect online forum posts, or any page that mentions my name, Google search in the early days will show them. This exact string can be a computer error message, a product model name, or a phrase in a chat room that you are trying to locate. Quite effective. But today, Google search has “smartened up”. It no longer is able to show pages you want where a exact phrase shows up, even if you double quotes your phrase "like this". But, it tries to interpret your search as if a human is asking a question about that phrase. For example, if i search “Xah Lee” now, i'll get pages that contain info about me, my website, my blogs, my Google profile, my Facebook, my Twitter, my yahoo etc pages. All the hundreds of other pages that exists that merely contained the string “Xah Lee” are not returned in the result, even if you went to page 20 or something. Is this smattering up good or bad? It is probably more useful to majority of people most of the time. But it also made it hard in many situations where you really just need to find pages that contains a particular string exactly, as if searching a file system or database.